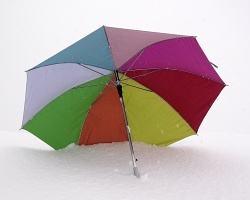 How can I reuse or recycle … an umbrella cover? | How can I recycle this? 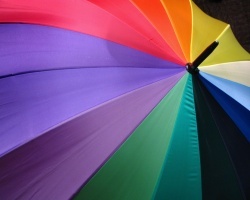 How can I reuse or recycle … an umbrella cover? I have an umbrella cover – it’s a pretty black and pink tough fabric, originally from Accessorise. Unfortunately i left the umbrella that went with it on a train… any ideas what i could do with the case? I usually have the opposite problem – losing the cover – so I’d probably just stash the spare cover in a drawer until I lost the one from my new umbrella but aside from that, any other ideas? Ones that would take advantage of the cover’s prettiness and water resistant would be best but obviously any suggestions are welcome. It would be great for storing paint brushes, especially if they’re still a little damp when you put them away. Or use it for a bottle of something you’re afraid might leak when traveling? I actually sent this in but have been inspired by today’s craft guide in the Guardian and now have several ideas for my umbrella cover! Unpicking the long stiched side, sewing up the open end and attaching poppers or similar would make a pencil case/ make up holder etc. Use it for arts and crafts. Make a card, use it as wrapping paper. It looks colorful so it will be perfect for any decorative design. cut the fabric off and wrap it around your head, cut eye holes in it and use it as a mask when robbing a bank. Use it with some rope to strangle someone. use it to make a rodent tunnel.Maybe a support for tree seedlings? Find an empty plastic bottle, cut the top off the bottle, slide the bottle into the umbrella case, fill bottle with water, position flowers in bottle. Why not use it as a mobile phone holder/cover, or if you have a removable front from your car stereo its an ideal size to store that. Make a kite or two. Make a rain poncho for a little kid. Attach it to the ceiling around light fixture or fan for a new look. Use two triangles to flare up pants or jeans. Sew super modern carwash skirt.